When we last left off, the Party on a Stick was coming together pretty well. Menu was set, agenda was loose – because we’re talking about a 4-year-old, folks; his attention span is no longer than a twig in many matters – but the cake was a new issue. Our kiddo loves cake pops, so “on a stick” criteria would have been easily met, if not a little too cliche. But then he started talking about cake. As in “cake” cake. Not on a stick. Technically, making a “cake” cake would be less time-consuming than the cake pops. And there’s something about having a cake, with candles to blow out, that really caps off a birthday celebration. So, let’s review his minimum standards for a fourth birthday cake: chocolate cake. Vanilla cream in between the cake layers. 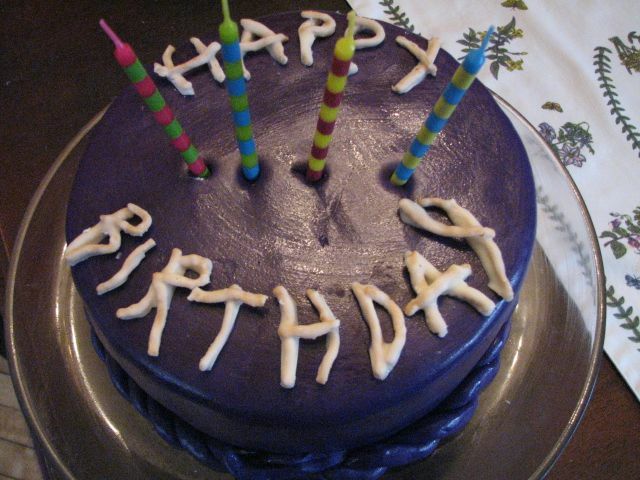 And purple frosting. That left me wondering how to work a stick-like element into the cake. Until I remembered my husband’s witty “Blair Witch” reference one morning after finding an artfully-arranged pile of sticks next to his side of the bed. And in a weird firing of synapses in my brain, raced back to those little bird nests I built for Easter place settings using melted chocolate and…chow mein noodles! The Type-A wheels started spinning. I did have an unopened bag of chow mein noodles sitting in the pantry. 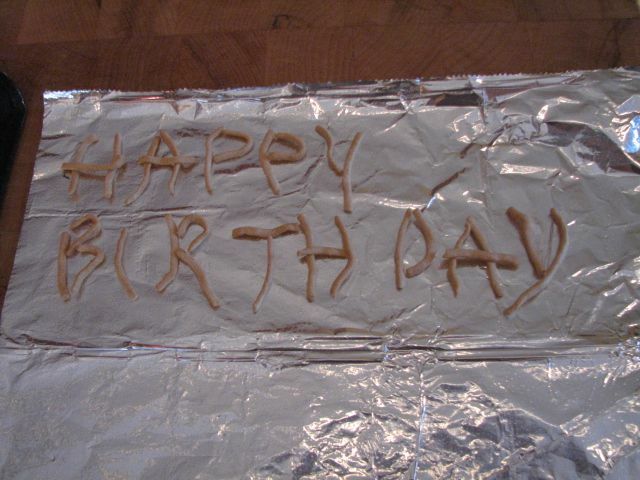 It wouldn’t be too weird to just pour them out onto a cookie sheet and see if I could pair together random noodle shapes to make letters that spell “happy birthday,” would it? Then, borrowing from the recipe for Betty Crocker’s “ting-a-lings,” I melted a little dish of white chocolate chips, added some butter and then a little vegetable oil to smooth out the texture and provide the perfect little glue/bath for the noodles to hold their shape and deliver the message. A little ramekin was all it took to dip each noodle in and set up the letters. Note: I used wax paper to make release easier, and leveraged the old trick of using some refrigerator magnets to hold the wax paper flat to the cookie sheet. 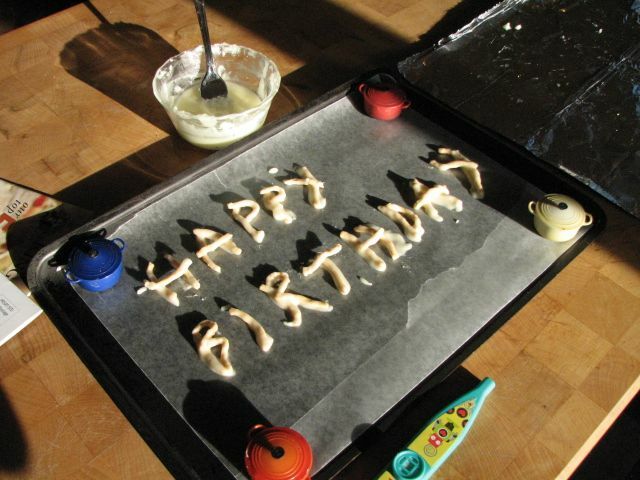 The kazoo was supplied by the Birthday Boy, bringing a little background music to the kitchen work. A little wacky, a little wild, totally perfect for our birthday party. This was a fun way to work in something that personalized our guy’s cake beyond what might be found in a bakery. He was more than tickled to see his vision for a birthday cake come to life. In all honesty, it has me a little fearful of what he might dream up for birthday cake concepts next year. Previous Post It’s a party on a stick. Next Post Holy schnitkes, I done knit this!